All makes car servicing in Birstall & Batley with The Motor Family. With the cold mornings car batteries are one of the main causes of breakdowns at this time of year. If you have received a ‘low battery’ warning on the dashboard or if the starter motor is not turning over correctly on startup it would be worth getting your car’s battery checked. If you have any concerns about the charge capacity of your car’s battery we would be pleased to check it for FREE. We have the latest Bosch Battery Tester and can supply you with a printout from the tester. Why have your car servicing? At The Motor Family we would love to care for your car. Regular servicing can help keep you and your passengers safe, reduce the risk of breakdown and even help to maintain your car’s value. Our highly trained service technicians use the latest equipment and fit only quality part. We appreciate that value for money is important to our customers so we offer a range of servicing options. Below are the different service options that we offer. All prices include vat. All prices are inclusive of VAT, Parts and Labour (Specialist oils plus £25). 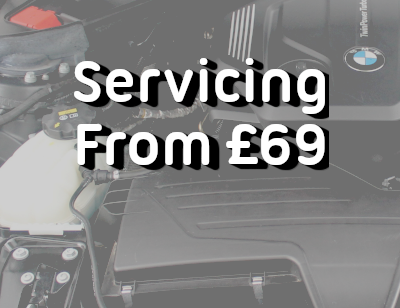 The pricing for a manufacturer level service varies depending on the age and mileage of your vehicle so please give us a call for a quote on 01924 422550. We offer a free collection and delivery service to customers near to us. If you are interested in collection and delivery please contact us on 01924 422550.